Sisters Alyssa and Jennifer Stalley of Williams recently returned from Wyoming, where they participated in the Bighorn 100, a horseback endurance ride. It was a replacement ride or sorts in that the Stalleys were scheduled to participate in the 54th annual Tevis Cup, a 100-mile ride from Truckee to Auburn on the same day. But because of all of the recent wildfires in Northern California, the air quality was poor and event organizers canceled the Tevis Cup. The Stalleys rode in the 100-mile Wyoming event and their father, Chuck, rode in the 50-miler. Bill Adams and Kathy Davis run a unique, old-fashioned farm which is definitely a step back in time as they use their mules and antique equipment to run it. Modern farm equipment is not allowed. "When I was a boy, I grew up doing this stuff," said Adams, which explains his desire for keeping farming simple. Davis and Adams met at Bishop Mule Days in Bishop, CA a few years back and they realized they had a lot in common. Davis was a racehorse trainer and endurance rider. After they got to know each other, Davis moved to Fallon to help out on Adams' farm and she took to the mules right away. "Kathy just jumped on the wagon and it looked like she was born to do this," Adams said. Davis, originally from California, grew up with a love for horses. Her parents couldn't afford one, so she bought a "dingbat Arab" with the money she earned from her first job. Soon after, she became certified to train racehorses. Endurance riding came next. Davis has eight national championships in long distance riding and rode a tough section of the Pony Express route (Top Gun Speedway to Sand Mountain) this year. She is used to riding 25-30 miles at a clip. Maplewood State Park will host an endurance and competitive trail riding clinic Saturday, July 19. The event will begin at 10 a.m., finishing by 4 p.m. A light lunch will be served, according to organizers. The cost is $25 for the event. Persons curious about the fastest-growing equine sport in America are urged to attend and learn about the activity. Moreover, they can get questions answered that may even spur greater interest. • a mock vet check. 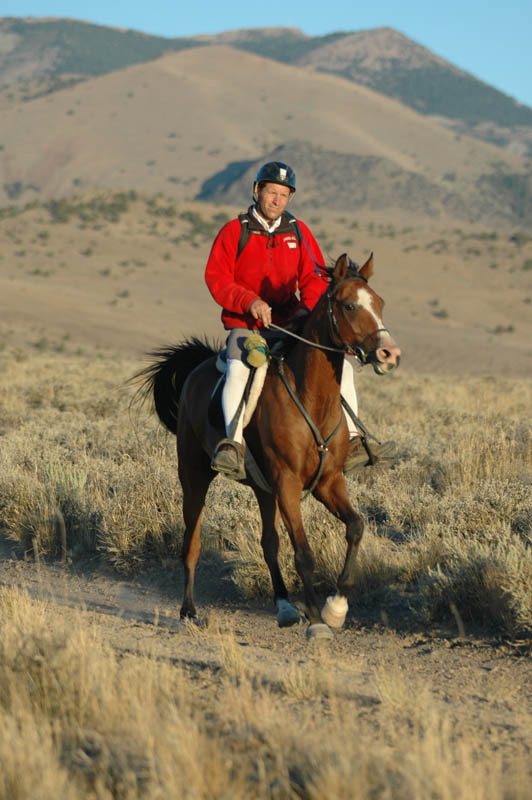 There will also be Q and A concerning the "ins and outs" of endurance and competitive trail riding. If it rains, the clinic will be held in the new shelter built this spring, otherwise it will be staged in the day rider area of the horse camp. Participants may also decide to make the trip to camp in the park. In any case, a Minnesota State Park sticker is required. After the clinic, a ride will follow for those who wish to take part. A Minnesota Horse Trail Pass is required. Reservations for camping can be obtained through the Minnesota State Park reservation system. Info: Charlotte Thompson, 28953 15th Ave. N, Hawley, MN 56549, 701-526-3734. Jan Worthington and Golden Lightening took top FEI placement and Best Condition award at the summer night ride in Florida. For Keith and Kristi Kesick, horse riding is a lifestyle. 'We're horse people, straight up,' Keith Kesick said Saturday. So when the Wisconsin couple decided to get involved in the search for a cure for cancer, a disease they have watched family members struggle with for years, they managed to incorporate their passion. They donated a handmade saddle to the cause. The Grinch, blanketed in soot and smoke, stole Christmas from Jennifer Stalley. Stalley her sister, Alyssa, were looking forward to participating in the 54th annual Tevis Cup, a 100-mile, 24-hour equestrian endurance ride slated for July 19. “It’s like Christmas to me,” Jennifer said. But, less than two hours after talking Wednesday about the upcoming event, Jennifer, 21, and Alyssa, 18, both from Williams, learned the ride had been canceled because of poor air quality caused by the rash of forest fires in Northern California. “We were really excited after talking about it,” Jennifer said. Canceling the Tevis Cup, however, might turn out to be a blessing in disguise, Alyssa admitted. That’s because the Stalleys now have the opportunity to participate in a similar 100-mile, 24-hour endurance ride, the Bighorn 100 in Wyoming. “It’s the same day as the Tevis Cup, so we’re never able to ride in it,” Alyssa said. Both of their parents have ridden in the Bighorn 100 and told their daughters about it. “A lot of the ride is at the 10,000-foot elevation,” Chuck said, noting while there are some trees there also are a lot of open meadows. Stalley added his wife, Pam, finished the Bighorn 100 first one year and also has a second- and a third-place finish to her credit. While all four Stalleys have ridden in the Tevis Cup together, this was to have been the first year that the two sisters were going to participate without their parents. “You have to be 18 before you can ride without an adult,” Alyssa said, adding she is disappointed she won’t get the opportunity this year. But, the Stalleys are content knowing the ride was canceled for a good reason. “(Ride director) Mike Pickett said the health and safety of the horses and riders take precedence over everything else,” Alyssa said. Chuck Stalley, who is a member of the Tevis Cup Board of Governors, said the U.S. Forest Service had given ride officials an alternate route around a portion of the trail near Foresthill that was closed because of fire. But, because of the air quality, directors opted to cancel the ride now rather than wait until the last minute. Canceling now also means riders can opt to participate in the Bighorn 100, he added. Usually, the Bighorn 100 is a much smaller race with perhaps 50 riders, as compared to the Tevis Cup, which has as many as 250 riders. “The cool thing about the Bighorn 100 is that riders who successfully complete the event within 24 hours receive a belt buckle,” Alyssa said about the same “trophy” awarded to successful riders in the Tevis Cup. Both Stalley sisters have earned four Tevis Cup belt buckles. They inherited their love for horses from their parents. Their father, who loved running cross country, first began competing in ride-and-ties, Alyssa said, which involves two riders and one horse. One person goes out ahead on horseback, stops at some point, dismounts and ties the horse and then takes off running. The second person, who started out running, catches up to the tied horse and takes off on horseback. They keep alternating through the end of the race. Chuck Stalley won several ride-and-tie events. Pam Stalley, meanwhile, has earned 11 Tevis Cup belt buckles, finishing as high as sixth one year. Besides participating in national events, the Stalleys also have ridden overseas. Alyssa said she and her sister served as grooms while their mother participated in an endurance race in the United Arab Emirates. Their father was the team captain. Pam Stalley also has ridden in France. While the Stalley sisters are excited about the opportunity to ride in Wyoming, it could be quite an interesting trek. That’s because, unlike the Tevis Cup, they will be riding on an unfamiliar trail. Since both events take place during daylight and night-time hours, riders have to rely a lot on their horses. In the Tevis Cup, Alyssa pointed out a portion of that ride traverses a narrow trail hundreds of feet above the American River Canyon. Glow bars attached to the breastplates on the horses help light the trail for the riders, Alyssa said. One year she thought the trail was clear so she kept urging her horse, Tiki, to start trotting. But he wouldn’t, she said, and pretty soon they encountered a very rocky section of trail. Both girls said they love riding in the Tevis Cup each year because of the beautiful scenery. “There’s a mystical, magical feeling about the Tevis Cup,” said Jennifer. “There’s no other ride like it,” added Chuck Stalley, who has three Tevis Cup buckles.